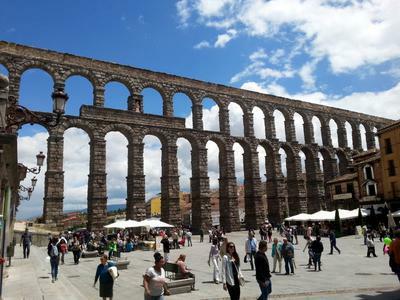 Acueducto de Segovia - 1st C, 3 - 5 ton blocks of granite, no mortar, still carries water today! We just got back from walking round the outside of the ramparts encircling Segovia, close to the 14th C Jewish necropolis. Lunch is local bakery bread, jambon iberico (the best Pata Negra), locally produced hard salty sheep's cheese, figs, and sliced veg washed down with gazpacho....yummmmm. Later, off to walk over the river valley amongst dwarf oak woods - Chris is churning out beautiful paintings and sketches and when I run out of shutter-finger energy. 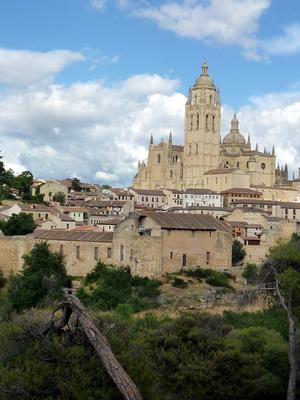 I'm buried in Tim Moore's "Spanish Steps"....an over-humoured account of his walk from Roncevalles to Santiago, following The Camino with a donkey to carry his earthly burdens! Must do it soon, but without the burro. Its rained two days in a row here - first time I've seen rain in Spain outside Galicia and Asturias, but I think someone once said that it "falls mainly in the plain". 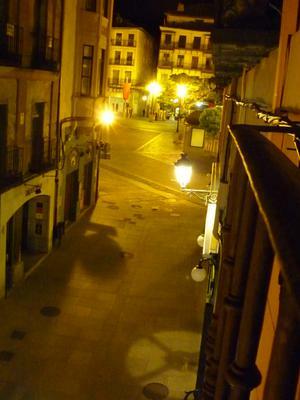 The Castilian plateau qualifies. It's spectacular panoramas are quite uniquely and cryingly beautiful, and we are sat right amidst it, on a hill, covered with beautiful ancient buildings. No wonder the Romans wouldn't leave until the Visigoths chucked them out! 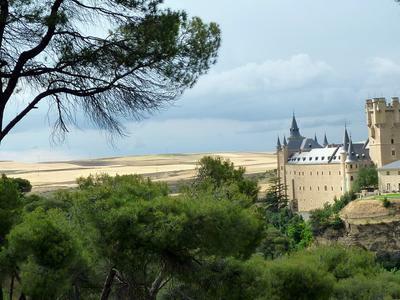 Thank you very much for sharing the wonderful historical treasures of old Spain. Appreciate your beautiful photos and delightful travel tales. For those of us who may not have the opportunity to visit these places, it's a joy to view these scenes and read about them.